To carry out its mission successfully, the FDIC must effectively manage and utilize a number of critical strategic resources particularly its human, financial, and information technology (IT) resources. Major accomplishments in improving the Corporation's operational efficiency and effectiveness are described below. Although the FDIC is not subject to the President's Management Agenda, many of these efforts are consistent with the spirit of that agenda. Beginning in 2003, the Corporation separated its investment expenses from its annual operating budget in order to ensure a more rigorous approach to the approval and management of major investment initiatives. The single most significant current initiative is the construction of additional FDIC office and multipurpose buildings adjacent to the existing facilities at Virginia Square. This project will eliminate the need for the Corporation to lease commercial space in downtown Washington, DC, and will substantially reduce future facility costs. Management processes have been implemented to ensure adherence to the project budget and schedule. Once completed and occupied, the new building will provide estimated cost savings of approximately $78 million (net present value) over 20 years, when compared to the projected costs associated with the current headquarters leasing arrangements. Construction has progressed on schedule and under budget. Occupancy began in mid-January 2006 and should be completed prior to the end of the first quarter 2006, as targeted. The FDIC's employees are its most important resource for accomplishing its mission. For that reason, it seeks to continue to be the employer of choice within the financial regulatory community and to operate a human resources program that attracts, develops, evaluates, rewards and retains a high-quality results-oriented workforce. This has been a difficult challenge over the past 13 years because the Corporation has been in a continuous downsizing mode as it completed the residual workload from the banking and thrift crises of the late 1980's and early 1990's. Although the pace of downsizing has slowed in the past few years, the Corporation continues to adjust both the size and composition of its workforce to meet the changing course of the financial services industry. In 2005, the FDIC implemented a number of strategies identified in the human capital plan developed in 2004 to procure the skill sets needed in this new environment. In 2005, the FDIC completed its workforce restructuring activities in the Division of Resolutions and Receiverships and the Division of Information Technology, and identified the skills sets needed to better position these organizations for future challenges. Through judicious use of Voluntary Early Retirement Authority, Voluntary Separation Incentive Payments, and outplacement assistance, our Information Technology organization met its workforce restructuring goals without the need for involuntary separations. The Division of Resolutions and Receiverships involuntarily separated 66 employees, while reducing its workforce by over 50 percent (a reduction of more than 250 positions from the 2004 authorized level). In both organizations, any remaining vacancies were matched with employees with the requisite skill sets. The Corporation also plans workforce restructurings in several support divisions in 2006. In 2005, the FDIC established the Corporate Employee Program (CEP) to begin the cross-training that will produce the flexible workforce envisioned in the FDIC's Human Capital Plan. During the year, four CEP training classes were held for approximately 100 new hires and existing employees. In addition, employees in the Supervision business line who had prior experience in the Resolutions and Receiverships business line received refresher training. The FDIC requested increased flexibilities from the Office of Personnel Management (OPM) to facilitate implementation of its Human Capital Plan. In 2005, the FDIC received OPM approval to establish a three-year career internship for the Corporate Employee Program. This delegation provided additional hiring flexibility with the ability to permanently retain or release these employees at the end of three years. The FDIC also established a Corporate Expert pay plan to hire and retain nationally recognized experts in a limited number of senior, non-managerial positions. In addition, the Corporation received authority to waive the dual compensation restrictions allowing the rehiring of annuitants in critical positions in the event of a severe banking emergency. In 2006, the Corporation will continue to seek increased human resources flexibilities through OPM authorities and legislation as needed. The FDIC conducted negotiations with the National Treasury Employees Union (NTEU) over compensation and benefits, and met its goals of providing competitive pay and benefits that allow the Corporation to continue its status as an "employer of choice" in the financial regulatory community. A significant portion of the compensation in all pay plans remains linked to each employee's contributions to the FDIC's goals and objectives and overall success. During 2005, the FDIC has strengthened and refined the FDIC Emergency Preparedness Program, which includes the Emergency Response Plan and the Business Continuity Plan. 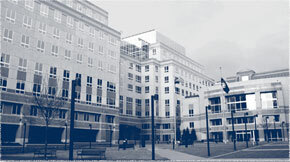 Some of the major accomplishments include expanding the capabilities at the headquarters alternate site to include IT back-up operations; developing a new emergency notification system to allow for immediate electronic and voice notification of staff; and conducting an annual business impact analysis (BIA) with major emphasis on IT systems and cost analysis. The annual BIA examined the Corporate Business Continuity Plan to determine whether it was current with regard to the Corporation's critical business functions and resources needed to manage those functions during an emergency. The Corporation also enhanced its emergency preparedness training with the development of computer-based instruction for all employees. In addition, The FDIC continued to conduct emergency preparedness exercises that included evacuation and shelter-in-place drills, as well as tabletop and functional exercises. On May 2, 2005, the FDIC implemented the New Financial Environment (NFE) and its supporting systems. The implementation was the culmination of years of effort by the FDIC to modernize its aging, highly-customized and complex financial systems environment. NFE is a corporate-wide effort focused on implementing an enterprise-wide, integrated software solution to support the current and future financial needs of the FDIC. The NFE also enhances the capability of other significant development efforts such as the Corporate Human Resources Information System Time & Attendance System, and the Legal Integrated Management System and also makes available more robust cost information that provides a basis of improved decision making. The FDIC continues to collect quality and timely information in 2005 with the use of FDICconnect. FDICconnect is a secure Web site that facilitates electronic communication with FDIC-insured institutions, and became the primary method of delivery for the quarterly deposit insurance assessment invoices through a rule change effective with the March 2005 assessment cycle. In 2005, over 150,000 transactions were completed by financial institutions using FDICconnect. Establishment of the Chief Information Officer (CIO) Council, advising the CIO on all aspects of adoption and use of IT at the FDIC. Additional IT expertise and best practices from global contracting partners. A leaner organization with fewer staff and an increased span of control. A realigned IT product and services delivery-management structure that is organized along the lines of the new systems development life cycle (Rational Unified Process - RUP). A new delivery management structure that in conjunction with the new Project Management Office (PMO) provides a consistent approach for all IT projects. Enhanced integration of information security requirements and perspectives in all IT projects. The consolidation of nearly 100 support contracts into six. The structure of the new contracts places emphasis on contractor performance and links contractor compensation to results achieved rather than costs incurred. The greater use of contracting partners for operation and implementation allowing in-house staff to focus on strategic business planning, design and consultation. Reduced costs through improving the efficiency and effectiveness of IT products and services. A targeted long-term plan for personal and technical development of all IT employees resulting from a new skills assessment to be conducted during 2006. In 2005, the charter of the Chief Information Officer's Council was expanded to include oversight of Privacy Act responsibilities, and the corporate Privacy Program was enhanced under the guidance of the newly appointed Chief Privacy Officer (CPO). The program's objective is to ensure that the FDIC is taking appropriate steps to protect personally identifiable information from unauthorized use, access, disclosure or sharing, and to protect associated information systems from unauthorized access, modification, disruption or destruction. One of the first priorities is in the area of employee awareness. The program requires mandatory privacy training so that all FDIC employees and contractors are aware of the requirements for safeguarding sensitive information and know where to obtain privacy-related reference material. Many initiatives were completed in 2005 in support of the newly enhanced Corporate Privacy Program, including mandatory computer-based privacy training and distribution of a Privacy Awareness Package.